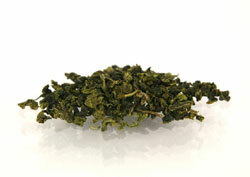 Oolong teas have a characteristic complex aroma and flavor. This complex nature is created by many factors, such as the tea plant varietal, the climatic conditions, the placement of the tea plants in fragrant orchards, and finally its unique processing. Oolong production is truly a living art form. These teas are graded by their aroma/taste (particularly the aftertaste), the liquor color and leaf appearance. The liquor color is green to greenish brown with green floral to full bodied tastes. Twelve Winds Tea Company oolong selections come from the Chinese Fujian Province. 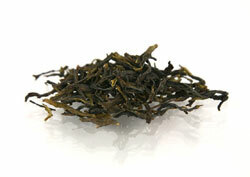 This Chinese cinnamon oolong is made from fine, whole twisted leaves. It produces a bright amber cup. This tea has a full complex fruity character with a hint of Chinese cinnamon (Cinnamomum aromaticum), which produces a sweet aftertaste. This is a very tightly rolled, gray-green "pellet" oolong from the Fujian Province. It has been rolled with ginseng. This oolong makes a bright, deep golden cup with a full mouth feel. It has a very natural sweet distinctive ginseng finish. This Phoenix Mt. 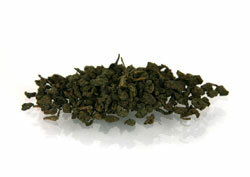 oolong is a dark roasted, twisted oolong with a distinctive, natural sweet honeysuckle-almond flavor and fragrance with a deep golden yellow liquor. This tea has a sweet, lingering aftertaste that is memorable and complex with a high floral aroma. 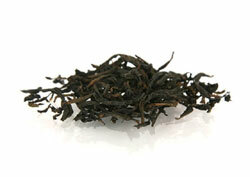 This tea has a fine, tightly rolled, dark green leaf, which makes a bright golden cup of tea. 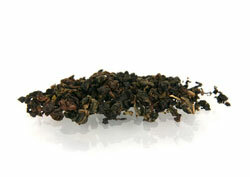 Roasted Iron Buddha oolong is very fragrant with a hint of lilac and gardenia with a "toasted" element. This oolong from the Anxi Province has a brisk, smooth, and mellow taste. These large, twisted leaves are from the Fujian Province. This tea makes a cup of bright amber liquor with a full complex, fruity character with notes of chocolate and narcissus. However, some folks say the fragrance is a bit like a leather shop.